Idocus has been presented at the Hengstkeuring in Den Bosch in Febuary 2001. He was accepted to go to Ermelo for the short 3 week test of the 70 day stallion performance testing. He was reviewed by the stallion committee and was named an "Approved" stallion at the end of his testing on March 31st, 2001. I am proud to announce that Idocus is the first stallion to be born in the Netherlands, "made" in the USA and returned to the Netherlands for Approval! Idocus has been ridden by Marlies van Baalen, the daughter of the renowned rider of Olymic Ferro, Coby van Baalen. Idocus was unable to leave the training and testing grounds of Ermelo for quite some time due to the Hoof and Mouth Disease that was spreading throughout Europe at that time. Even though Idocus was being shown at the Grand Prix level before his approval we thought it best to bring him back slowly. He has been showing at Prix St. George and Intermediare I for the remainder of 2001. Idocus has had a very successful show career so far in 2002 as an International Grand Prix stallion. Idocus' sire Equador is out of the finika-line, a mare line bringing several (inter)national show jumpers and approved KWPN stallions. Equador's great granddam Niki B, daughter of Finika and famous Sinaeda, bred Apollo, competing at the Olympic Games with Nick Skelton and winning the Great Prize of Aken. An approved stallion out of Finika-line is Ekstein. Sire of Equador is Dutch "stempel" stallion Voltaire; grandsire is "maremaker" Joost and great grandsire Trakehner Magneet, important for show-jumping partly because of his son Carneval. 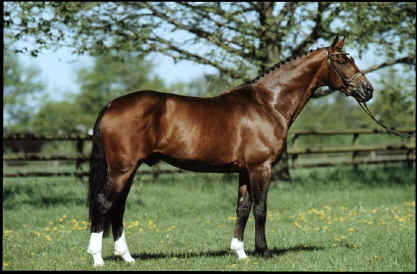 Equador is also sire of KWPN stallion Jackson. Dam of Idocus, Eretha, "Keur" with an IBOP of 92AA is a daughter of dressage breeding stallion Zonneglans, an approved son of LeMexico. Dam of Eretha is Viretha, daughter of Rheinland stallion Fresco (Geysir Trak X Fernflug I), and "Keur-Preferant" mare Iciretha (by Eclatant). Out of this mare line, which goes back to Greta, Hannovarian imported daughter of Forstmann, several good dressage horses were bred. A full sister of Idocus' dam is Grand Prix dressage horse Flip (Mirjam Mischner). Idocus was born in the Netherlands in 1990 and imported as a weanling. In 1991 he was shown in hand at the Dutch Keuring at Iron Spring Farm and received a first premium and placed 4th in the "Top Ten" yearlings. He was raised at Royal Starr Farm in New York up until he was three years old. In 1993 Idocus went to the 100 day Stallion Performance Test. The testing site was in Keswick, Virginia, at November Hill Farm run by Gerd Zuther. He was the youngest and greenest stallion out of the 18 stallions that entered. He went on to become the Grand Champion and held the highest jumping score of all the stallions. At that time Idocus was accepted into the ISR/Oldenburg NA registry and was awarded a Lifetime Breeding License. Idocus then went on to become the Grand Champion of show at the prestigious Dressage at Devon in September of 1994. Idocus has been shown at every level of dressage and has won numerous championships at every level under the competent hands of 2X Olympian Lendon Gray where Idocus made his Grand Prix debut. Check out the Idocus news page for his latest accomplishments.